Hi friends! Today is my 17 year wedding anniversary! Isn’t it funny how time flies? My hubby and I have the entire day to spend together and I am so thankful. Some days are ideal and on other days we have to make the most of the time we have and try to Squeeze the best out of the day we are given. I really liked this sentiment: “When life gives you lemons…Squeeze the day” because it is a good motto I think. It’s also nice if you like to decorate the inside and outside of a card. 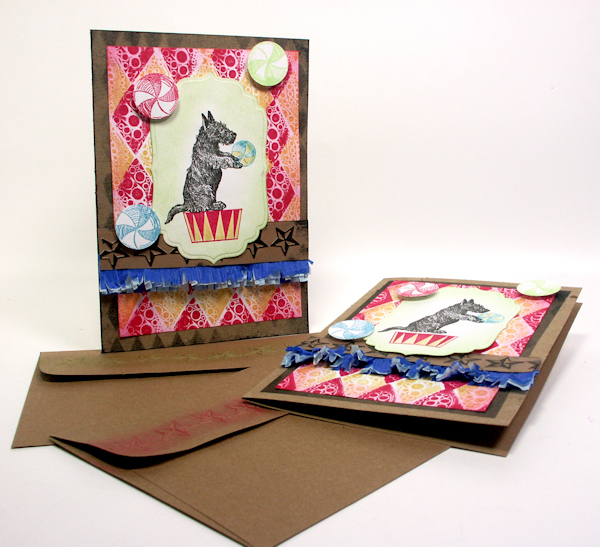 Watch the video to see how I made this card! Squeeze the day, don’t hoard the washi tape and make the most from what you have! I hope you have a wonderful weekend and til next time happy crafting! Howdy friends! This project is really fun because you get to play and experiment and when you are done you end up with a bunch of cards! 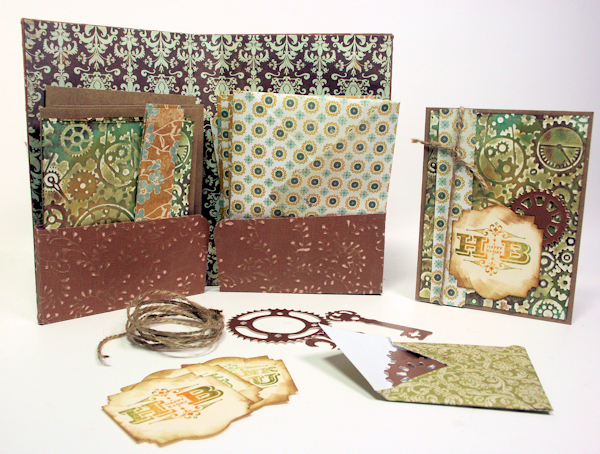 As you can see they give some textured, antiqued and grungy results perfect for backgrounds and surface treatments. If you want that die cut cereal box to look like decades old metal these will do it! I will share some tips for working with these powders and also show you how to add shading and highlighting to simple stamped shapes to make them pop and hopefully have you using up some scraps while we are at it. I don’t know about you but my scrap bin is getting out of control! (others shown-projects with these coming soon!) Tea Time Ladies, Fun Quotes-Darkside *These are unmounted stamps and come as a sheet of rubber you trim apart. I used a thin coat of Aleene’s Tack it over and over to make my stamps sticky. 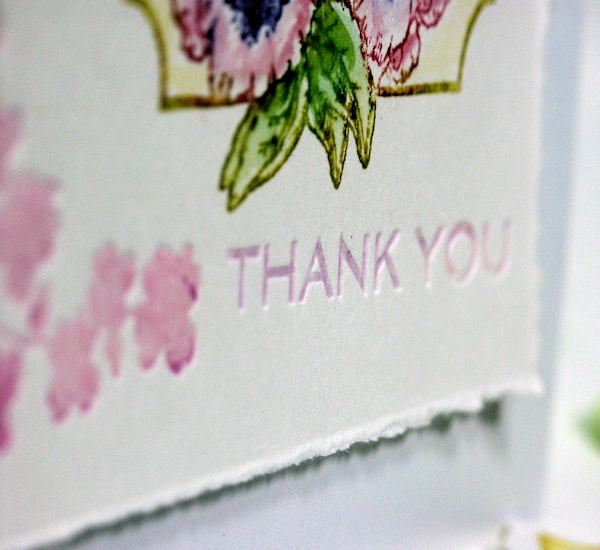 Mixing embossing powders in a background is fun but take care not to contaminate your powders. I like to use the main color first and return the excess color to that jar and then sprinkle on the secondary color. You can use the back-end of paintbrush or a craft stick to take out a tiny amount so there won’t be any contaminated excess to put back in the second jar. Embossing powder goes a long way, it is better to discard excess that has been mixed than to contaminate the whole pot OR you can keep mixed powders in a separate container for future use. Any media is fine for shading and highlighting but if you use distress crayons keep in mind they dry fast and smudge them as soon as you apply color or it won’t smudge. Bumpy paper needs strong adhesive. Anytime you are dealing with warped of bumpy paper you need stronger adhesive because you have fewer contact points (in the case of pressure embossed paper) so you can either use more adhesive (as I did with my ATC tape) to make sure there is contact in more areas or use a thicker adhesive (like I did with hot glue for my stamped pieces) to marry the substrates. Hot glue is aces for warped watercolor backgrounds too! Really tho, what is hot glue not good for? I hope you give some of these techniques a try in your next project and til next time happy crafting! Wanna win some fishy stamps? It’s giveaway time!!! All you have to do is leave a comment on this blog post for your chance to win. I’ll pick a random winner next Friday. If you don’t want to wait you can buy them here, be sure to use my coupon code (Lindsay10%) to save 10% on your regular priced purchase. I have to confess, I’ve had these stamps on my desk for about 2 months. I really loved them but I wanted to do them justice. “Enough!” I said this week, I’m just gonna play with them, and so I did! 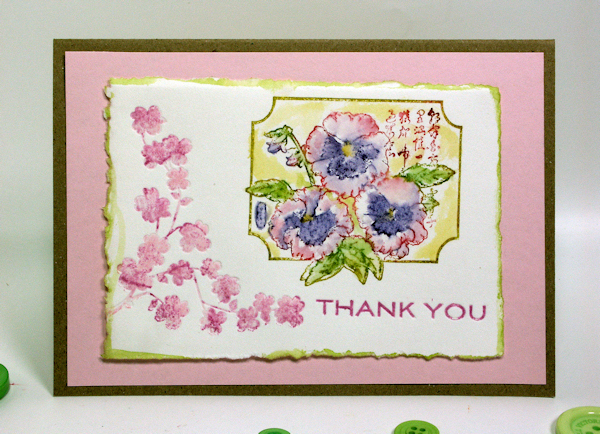 Watch the video to see how I made the stamped panels for these cards. We are going to have fun with glossy cardstock. 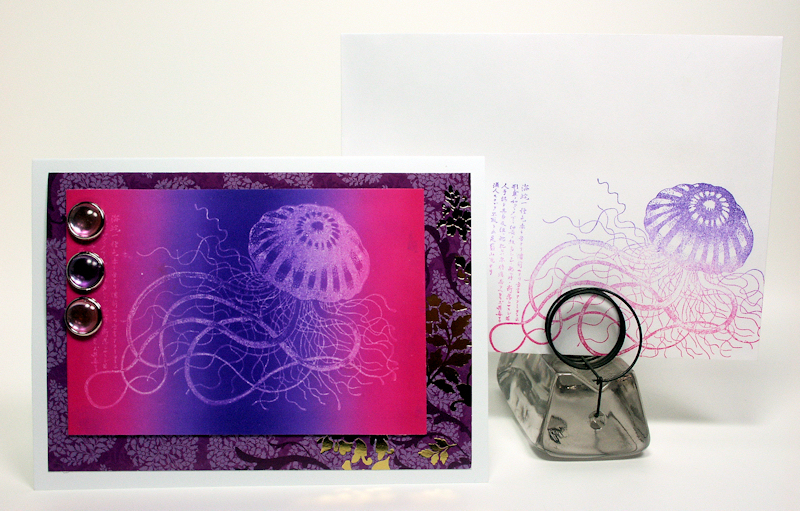 I used a Ranger resist pad of the jellyfish, you might be able to use your embossing ink-pad for this too as long as you don’t get too much ink on the stamp, embossing pads are spongy while the resist pad is firmer. Either way make sure you dry the paper well before inking. 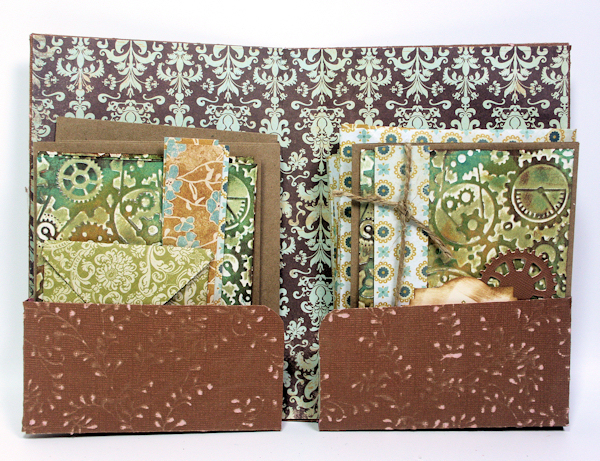 The pattern paper I used on both cards are from the Taj-Mahal mat stack from DCWV, I like the mat-stacks because I don’t waste any paper, they are perfect for layering on a 5″x7″ card. I hope you found my creative play today inspiring. I hope you try these techniques and I really hope you leave a comment to win these fab stamps from About Art Accents! Have a great night and til next time happy crafting! 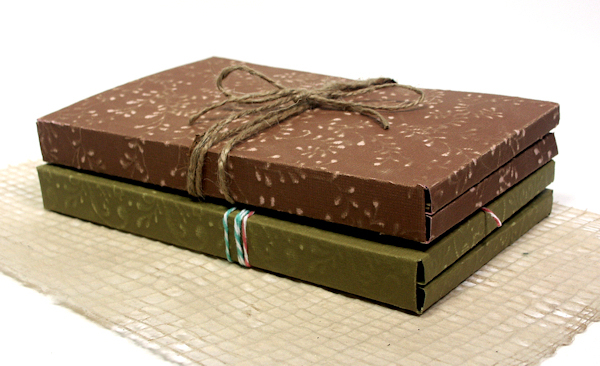 Pick Your Prize,Make a Gift Set & 20%off at Green Sneakers! You could also use the portfolio to make a painting studio on the go, put a small palette of paints and a waterbrush on one side and cut watercolor paper on the other, instant art studio! Use this idea with the supplies you have in the colors you like. I’m sure you can make a perfect stationary set for anyone. So, to recap: Visit Green Sneakers and check out the goods, leave a comment on my blog letting us know what TWO templates you want if your name is drawn. That’s it. Easy Peasy. If you feel the urge to shop use the coupon Lin20 to save 20% on your order. This contest is open to U.S. residents only, sorry for any inconvenience:) Good luck! Thanks for stopping by and til next time happy crafting! Circus Dogs & More Moldy-Oldie Fun! When I was cleaning and sorting I cam across another moldy-oldie tool I loved called the colorbox stylus with moldable tips. Wow, this is fun, you heat the tips with a light bulb, press it to a texture such as a stamp (I used the bubble background from Lost Coast Designs) or embossing folder and you have a cute shaped stamp. Don’t worry, you can also do this with cheap kids foam blocks from the dollar store! Why am I gabbing? Just watch the video! 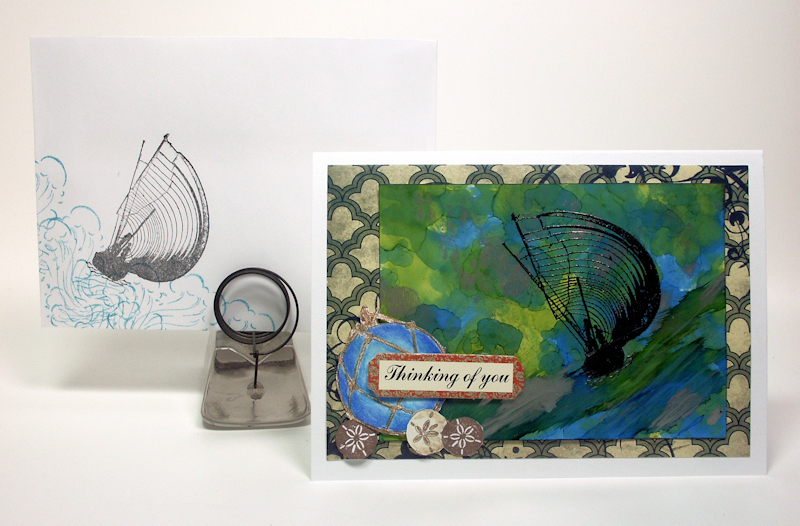 We will make this card from start to finish and drag out other oldies but goodies too! Fun huh? I love the crepe paper and stenciling too, it is great when we can mix and match old with new and come up with a look that is all out own dontcha think? 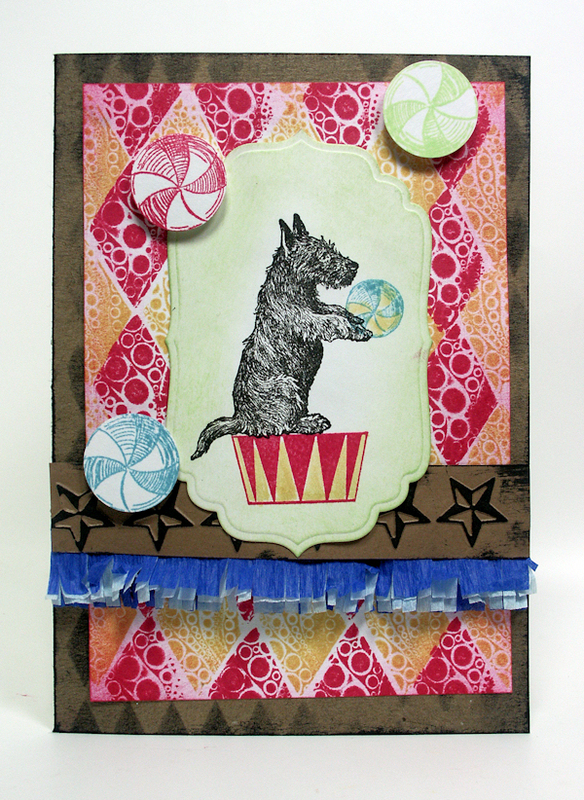 You can find the Circus Dogs stamp set from Lost Coast Designs here. So, what old tool or supply have you used lately? Thanks for stopping by and til next time happy crafting! 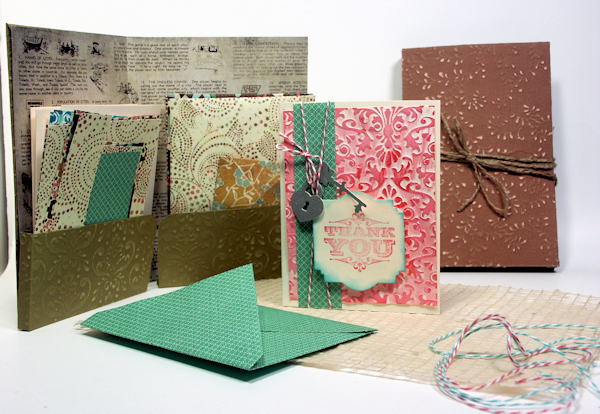 It’s Stamp Giveaway Time & a Watercolor Letterpress Tutorial! Hi folks! Another busy summer week around here, whatever happened to the lazy days of summer? 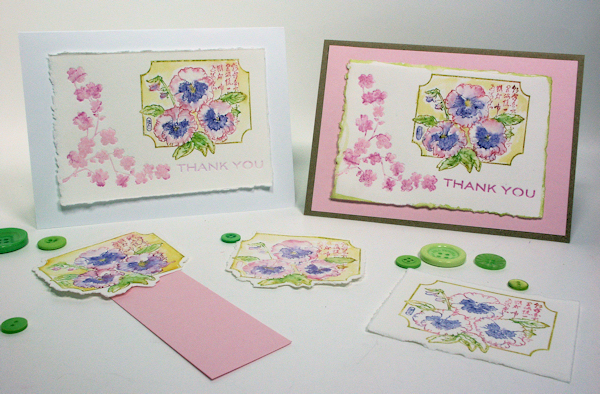 Anyway, this week I will be giving away this beautiful pansy collage stamp from About Art Accents. Leave a comment and next Monday I will pick a winner. Easy as pie! I love using my watercolor markers to stamp! You can be specific with your coloring then all you need is a damp brush to give it a painterly feel. 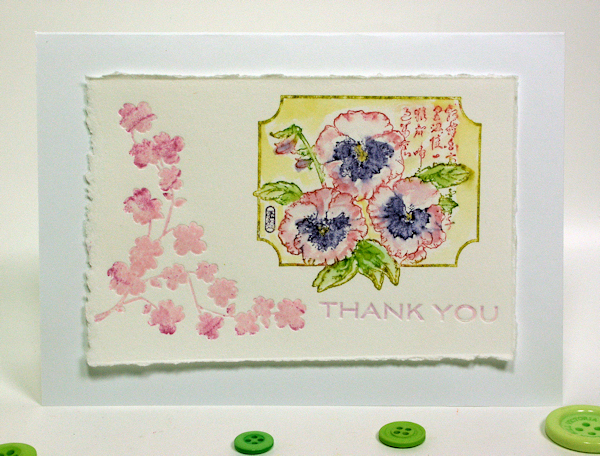 Watch the video to see how I made this card. You can also see my homemade letterpress in action! I know you are going to ask so the paper I used is Rives BFK, it comes in 22″x30″ sheets and most art supply shops will carry it for about $8 a sheet but it is cheaper to get it online from Cheap Joe’s Artstuff (5 sheets/$22.) 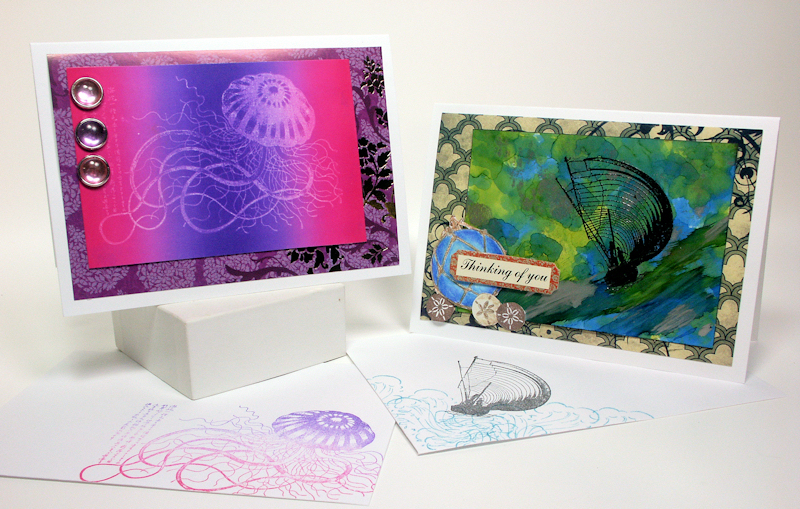 The paper is smooth, thick and soft but it handles water very well so you can stamp, watercolor, and letterpress on it. I always loved the look of letterpress (although try to get a decent photo of it!) so when I started seeing the expensive Lifestyle Crafts plates go on clearance everywhere I snagged them for about $5 a kit. I guess it was a trend that never took off for the home crafter. You can open an embossing folder and use it with the Rives BFK to letterpress too, it is the same plastic as the plate , well near enough anyway, the plates a bit more rigid. Another cool thing about using markers to stamp is that you can get 2 impressions from one inking! In the next example I misted the stamp with water and restamped, look how much ink is still on the stamp. 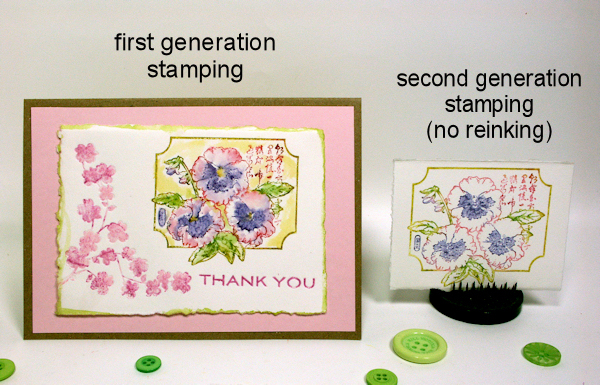 Get more stamping for your effort! Be sure to leave a comment for your chance to win this beautiful stamp from About Art Accents and if you decide to shop you can use my coupon and save 10% on your regular price order: Lindsay10% Good luck and til next time happy crafting!